Product prices and availability are accurate as of 2019-02-03 17:32:37 UTC and are subject to change. Any price and availability information displayed on http://www.amazon.com/ at the time of purchase will apply to the purchase of this product. 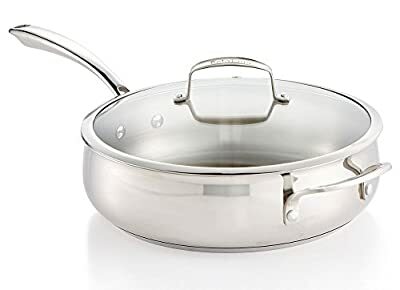 This 5-quart pan from Belgique, is made of non-reactive stainless steel with an aluminum-encapsulated impact-bonded base for quick heating and great performance. Bell-shaped interior for heat and moisture retention. Great for searing meat or veggies. Strong riveted handles. Dishwasher safe. Manufacturer's limited lifetime warranty.